A Thing for Roses: Are you tired of the projects yet? I hope not because I have been one motivated and busy chickie. Today it was painting, and then more painting, then some sanding and then more painting. Do you remember this buffet I got awhile back? It had a decent finish, but quite a few scratches and I knew it would look cuter (more cute?) with a little paint and some sparkley glass knobs. Here's what it looks like now. I also worked on a vintage coffee table, a lap desk, a tall skinny display cabinet and some other miscellaneous items today, but they are not quite picture worthy just yet. Yesterday I went to Joy's to work on some projects for Farm Chicks. Here's a little something I made. I just love it. So simple and sweet. 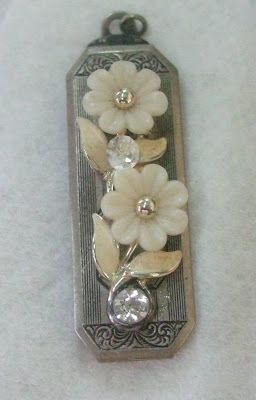 A little pendant made from an antique money clip and a little piece of a vintage bracelet. Joy gave me a silver chain to go with it. Now, tough decision, keep or sell? You'll have to come to Farm Chicks to see the other stuff we made. Way cool, trust me. My good buddy and finder of cool stuff, Mitzi dropped by today with a couple cute crinolines she found at a sale for me. My friends Kate and Suzanne stopped by too to give me a little May Day bouquet of lilacs. I've said it before and I'll say it again, I have the best friends. No I am not tired of the projects yet. Love the before and after pix. Thanks again for sharing. LOVE what you've done with the dresser! I'll never tire of your projects! Inspires me to get busy and do some of mine! 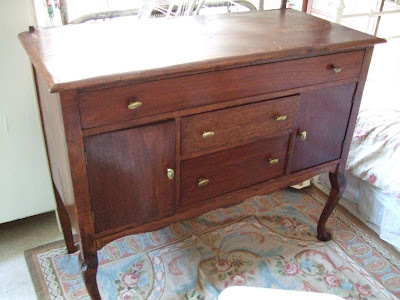 This chest is really, really pretty and I would love to sneak over to your house and steal it away for myself!! You did such a good job on this transformation. PS - love the little charm too! Not tired at all, I enjoy seeing your projects...keep them coming!The pendandt is so sweet! Crinolines! Lucky girl, their my newest obsession! Never do I tire of being inspired...I love seeing before and after pics. You have created beautiful items - thanks for sharing! I love how the the dresser! You did a great job! 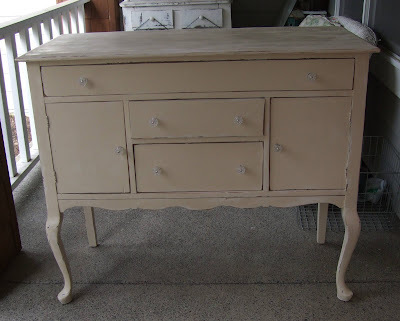 That buffet looks a TON better - amazing what a litle paint and elbow grease will do. Your little money clip necklace is adorable too. You have been a busy gal! That dresser turned out gorgeous! I don't know how you would be able to part with either the dresser or the pendant. Both are spectacular! What is it about paint, it really makes a difference in furniture, especially if its white. The dresser turn out great. I'm enjoying your blog, so I decided to add you to my list if you don't mind. I'll be back another time...Have a great Sunday Afternoon. That pendant is so pretty...I love it so much..You really did an amazing job...Your latest project turned out great..I love it white and the knobs are just amazing to..
What a fabulous job on your buffet! I have one that looks like the "before" and I would love it to look like the "after."